Well yesterday I cut the high temperature forecast even more for today and that looks like it was the right decision as temperatures today are struggling in a big way with a pretty solid (although thinner in spots) deck of low clouds combined with light NE winds are conspiring to keep our temperatures around freezing this afternoon. The cloud cover is a sign of a moist layer only a couple of thousand feet thick from the refrigerated chilly air from the surface up to a couple of thousand feet off the ground. IF there was a decent wind out there we’d probably stir up the air as have a nice sunny afternoon…but that is not the case today. Once again the snowpack/cloudcover cycle is hurting us with our sensible weather on the ground. This will gradually change over the next 48 hours…but first things first. Tomorrow is a holiday which may work in our favor because I’m concerned overnight tonight…towards or after 12AM that we may have some freezing drizzle patches or even a few patches of freezing rain move on through for about a 6 hour window till about daybreak tomorrow AM. Even though temperatures tonight may actually go up a couple of notches, the pavement is going to remain cold. So what falls, even if it’s liquid, may tend to freeze on contact creating black ice conditions in places. This issue could linger till about 9AM tomorrow from S>N through the KC area and a bit later farther to the NE of the KC region. Freezing rain advisories and winter weather advisories are in effect the farther NE you get from the metro…the freezing rain advisories are in pink. The moisture that will create the freezing precipitation is now across eastern TX and slowly flowing northwards…it will speed northwards later this evening and will arrive near midnight or so from the south. The cloud deck will get much lower to the ground and it will become thicker. You can see the moisture in the form of a cumulus/stratocumulus cloud field from near the Red River and points south. 5000′ winds of 35-45 MPH from the south will bring that gulf moisture northwards. Once this system passes through…we’re finally going to see the weather change…and that change will be felt as early as tomorrow afternoon. The moisture will be swept to the east of the region and I would expect to see sunny skies in the afternoon. That will allow temperatures, which will start around 32-35° to pop into the upper 40s I think…and that will help end the cycle that we’re in because we’ll start to melt the snow…maybe not entirely…but a good deal. Then on Tuesday as warmer air aloft moves into the region…we should really see temperatures pop. Yes the much delayed warm-up will finally happen with highs int he 55-60° range for many from KC west and south. 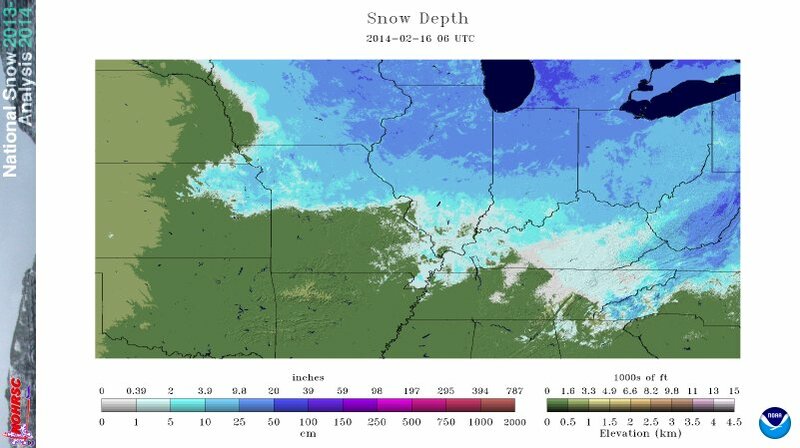 Farther to the NE of the metro…it may still be a bit of a struggle with the left over snowpack and the winds blowing over an increased distance with snow on the ground. So as we chew away at the snow pack…it will help us maximize the warmth. One thing that will not help is that there will not be a lot of wind in the PM on TUE…that will reduce the amount of mixing of the air…and this is where the amount of snow left will go a long ways to determining how high in the 50s we go. I’ve got 54°…I’ll probably up it to 56° for KCI this afternoon…I wouldn’t be surprised to see some 60s pop up where there is no snow on the ground. My suspicion is that Wednesday may be a few degrees cooler because of cloud cover issues. That will set the stage for our next rain-maker due in Wednesday night into Thursday…there are somewhat conflicting model data about the potential of a few rumbles of thunder with this system…we’ll deal with that aspect tomorrow or Tuesday. I’m not overly excited at this point about those prospects but I guess I could see a window of opportunity for something later WED night or early THU AM. The air the Thursday system will bring in really won’t be that cold and we should moderate nicely on Friday again. Then there is the matter of NEXT weekend. Some model data had a snow scenario a couple of days ago…then all the models abandoned that idea and today the GFS/Canadian still are in the NO snow camp, while the EURO model is back in the YES snow camp with an accumulating snow next Saturday (borderline moderate snowstorm). At this point it’s the only model doing this so I don’t want to really get overly excited about the prospects. This is all connected to a storm in the Gulf Of Alaska…spinning around and sending out disturbances towards the NW coastline. and finally…I think we’re all starting to feel this way! Have a great day and thanks for reading the FOX 4 Weather Blog. Say, have youever seen this earth wind map ? It is very neat. I just wonder how/who makes it…what generates it ?